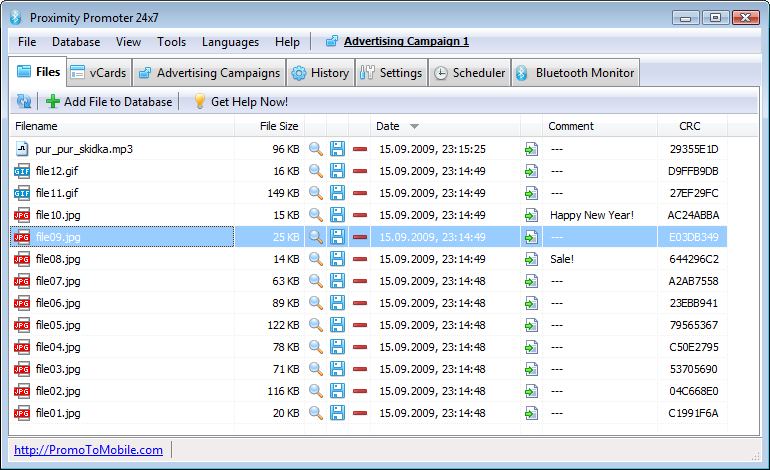 Bluetooth Promoter 24x7 is Bluetooth Marketing Software for proximity advertising via Bluetooth connectivity (Bluetooth Marketing). Bluetooth Promoter 24x7 provides free transmission of any files (TXT, MP3, JPG, 3GP, MP4, vCard, vCal) to any Bluetooth devices (mobile phones, smartphones, hand-held devices, communicators, laptops, mini-laptop computers) via Bluetooth. Does not require any special hardware - only a computer & a Bluetooth dongle. ...... Provides free transmission of any files (text, melodies, pictures, movies) to mobile and fixed devices over Bluetooth connectivity. * Bluetooth transmitters are regular Bluetooth Dongles sold at approximately $15. * Distribution of promotional materials (as files) to any Bluetooth devices (mobile phones, smartphones, hand-held devices, communicators, laptops, mini-laptop computers) within coverage. * You can use Proximity Promoter 24x7 for distributing your promo materials with no time constraints, i.e. 24 hours a day, 7 days a week, year around, without any additional expenses whatsoever. * Proximity Promoter 24x7 allows broadcasting advertisement within a range of up to 100 meters (depending on your Bluetooth adaptor). * Simultaneous distribution of advertisement to 1...7 Bluetooth devices located within coverage area (depending on your Bluetooth adaptor). Qweas is providing links to Bluetooth Promoter 24x7 for Proximity as a courtesy, and makes no representations regarding Bluetooth Promoter 24x7 or any other applications or any information related thereto. Any questions, complaints or claims regarding this application Bluetooth Promoter 24x7 for Proximity must be directed to the appropriate software vendor. You may click the publisher link of Bluetooth Promoter 24x7 on the top of this page to get more details about the vendor.